“Tet” itself means ‘festival’ and is the shortened version of “Tết Nguyên Đán”, which is Sino-Vietnamese for ‘Feast of the First Morning of the First Day’. Vietnamese, Chinese, Korean and Japanese base on the movement of Lunar to do anything: working, building houses, eating, playing, traveling … “Tet” is the start for all the things. 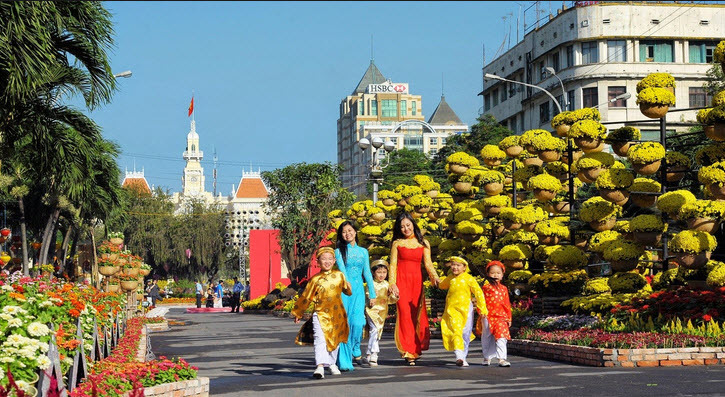 When is Tet holiday in Vietnam 2016 ? This year “Tet” falls on 7 Feb 2016 (the last date of the year of Goat) and 8 – 10 Feb (the first 3 dates of the year of Monkey). However, due to the weekends before and after this period, Vietnam government decides to extend the public holidays into 9 days, during 6 – 14 Feb 2016. 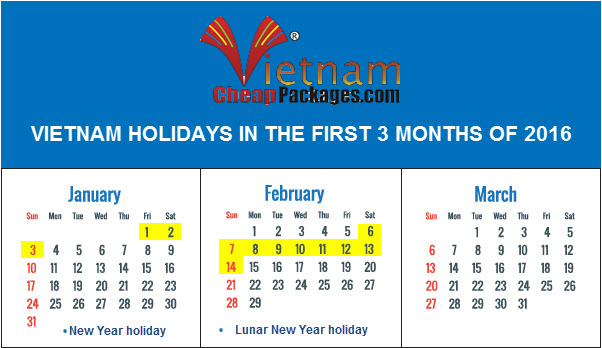 Tet holiday in Vietnam 2016 lasts from 6 – 14 Feb 2016 calendar. 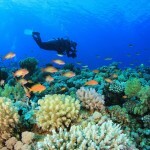 The long holiday opens a chance for tourism. 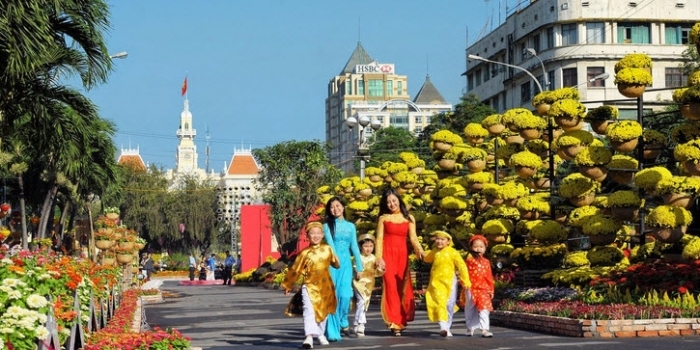 With higher income, Vietnamese tourists tend to travel instead of staying at home during Tet, and start their vacation right from the First Day of Lunar new year. If you have a travel plan in this period, you must book everything as soon as possible, otherwise face a really big trouble when all hotels and open buses are sold out, or extremely expensive. Train tickets for 1 – 20 Feb 2016 are sold out 2 months ago ! Forgetting the tourist crowds and the over-crowded buses, Tet is also an occasion for pilgrims and family reunions. Vietnamese people usually return to their families during Tet. Some return to worship at the family altar or visit the graves of their ancestors in their homeland. Although Tet is a national holiday among all Vietnamese, each region and religion has its own customs. During Tet, Vietnamese visit their relatives and temples, forgetting about the troubles of the past year and hoping for a better upcoming year. They consider Tet to be the first day of spring and the festival is often called Hội Xuân (spring festival). Many Vietnamese prepare for “Tet” by cooking special holiday foods and cleaning the house. There are a lot of customs practiced during Tet, such as visiting a person’s house on the first day of the new year (xông nhà), ancestral worshipping, wishing New Year’s greetings, giving lucky money to children and elderly people, and opening a shop. At Tet, every house is usually decorated by hoa mai – Ochna integerrima (in the central and southern parts of Vietnam) or hoa đào – peach flower (in the northern part of Vietnam) or hoa ban (in mountain areas). In the north, some people (especially the elite in the past) also decorate their house with a Prunus mume tree (also called mai in Vietnamese, but referring to a totally different species from Ochna integerrima). In the north or central, the kumquat tree is a popular decoration for the living room during Tet. Its many fruits symbolize the fertility and fruitfulness that the family hopes for in the coming year. “Bánh chưng” and “Bánh dầy”: essentially tightly packed sticky rice with meat or bean fillings wrapped in Dong (Phrynium placentarium) leaves. When this leaves is unavailable, banana leaves can be used as a subtitute. Bánh chưng (rectangular) and bánh dầy (circular) are symbolically connected with Tet and are essential in any Tet celebration. Preparation is time-consuming, and can take days to cook. The story of their origins and their connection with Tet is often recounted to children while cooking them overnight. “Hạt Dưa”: roasted watermelon seeds, also eaten during Tết. “Dưa Hành”: pickled onion and pickled cabbage. “Củ Kiệu”: pickled small leeks. “Mứt”: These dried candied fruits are rarely eaten at any time besides Tết. “Cầu Dừa Đủ Xoài” – In southern Vietnam, popular fruits used for offerings at the family altar in fruit arranging art are the custard-apple/sugar-apple/soursop (mãng cầu), coconut (dừa), papaya (đu đủ), and mango (xoài), since they sound like “cầu vừa đủ xài” ([We] pray for enough [money] to spend) in the southern dialect of Vietnamese. “Thịt Kho Nước Dừa” Meaning “Meat Stewed in Coconut Juice”, it is a traditional dish of fatty pork stomach and medium boiled eggs stewed in a broth-like sauce made overnight of young coconut juice and nuoc mam. It is often eaten with pickled bean sprouts and chives, and white rice. 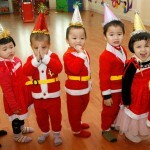 Christmas in Vietnam: Where to go ? Welcome to the home of creative travel to Vietnam & Cambodia. We help your holiday preparation more effective by creating informative, flexible and smart consultancy.